My parents brought us what had to be twenty pounds of the freshest, most fantastic tomatoes from their garden. We ate what we could, and I froze the rest for sauce later on in the year. And that was only a drop in the bucket for them; their garden produced no less than four wheel-barrels full of tomatoes (and counting). Ridiculous amounts of tomatoes. They’ve spent the last several weekends processing, canning and freezing, but it will all be worth it in a few months when there won’t be a decent tomato in sight. The raw tomatoes are mixed into the pasta just after cooking, so they start to soften and almost cook a little. This “sauce” is just perfect for fresh, seasonal tomatoes; in fact, I wouldn’t try it with anything but the fresh local ones because the flavor would fall flat with off-season, grocery stock. 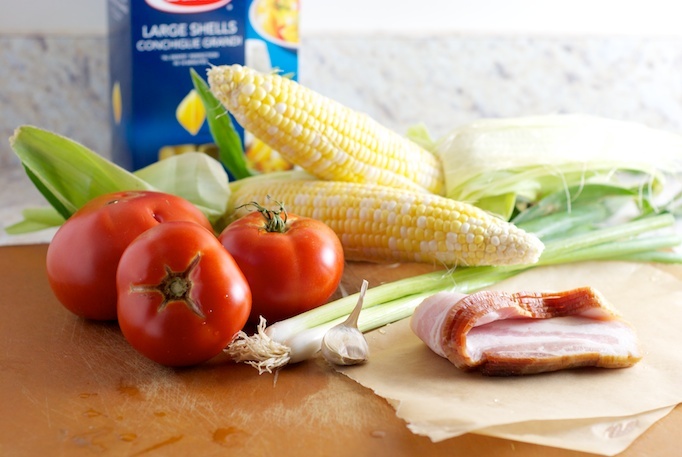 The bacon can be completely optional but tomatoes, corn and bacon is a pretty perfect pairing. I saved a little bacon to sprinkle on top for presentation, before mixing the rest in. 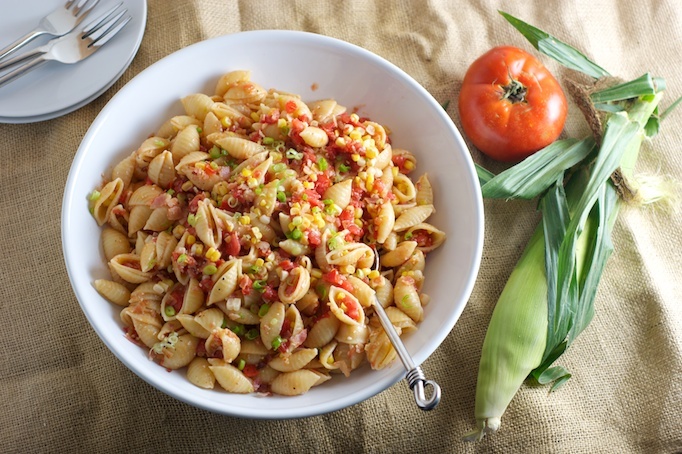 This dish is best made with fresh, seasonal tomatoes. Round style tomatoes are recommended since they are a little softer than plum type tomatoes, but feel free to use what you like or is available. 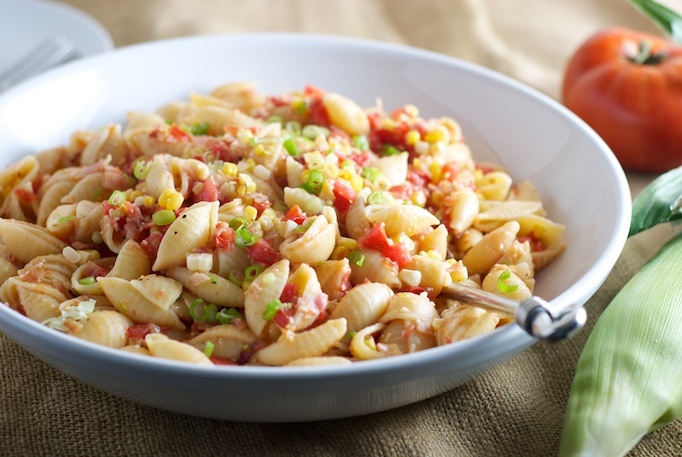 Corn can be added to the sauce raw or slightly cooked – your choice. Shaped pastas that will trap sauce work especially well for this dish; I chose shell pasta, but fusilli or orecchiette would be nice . Bring 4 quarts of water to a boil. 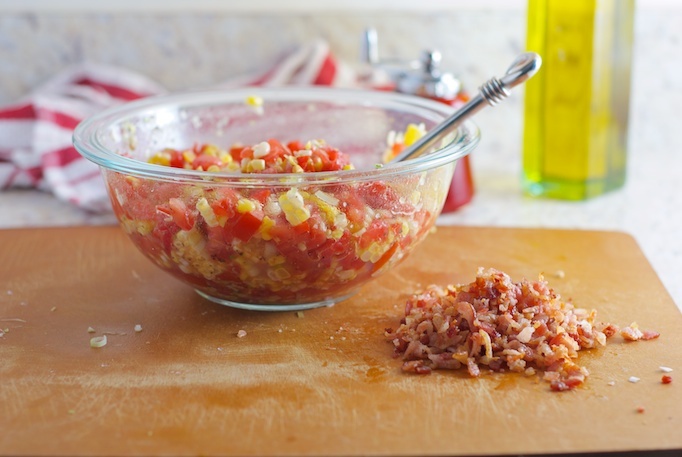 While waiting for water to boil prepare chopped tomatoes and fry bacon. For bacon, fry in a medium saute pan, until crisp. Drain on paper towels, and set aside until ready to use. 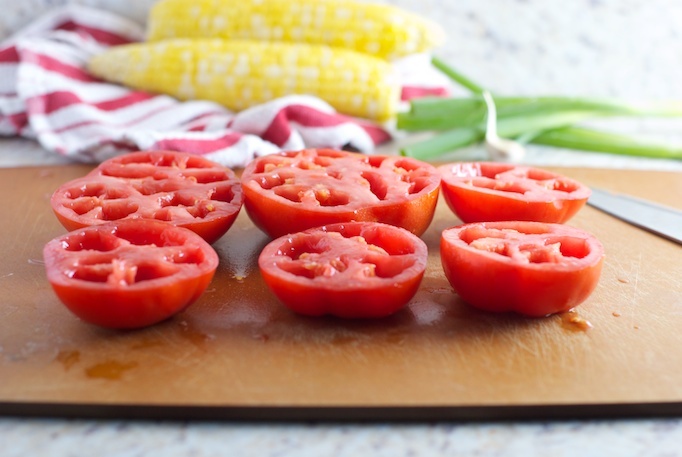 For the tomatoes, cut cross-wise (not through the steam). Gently squeeze over a bowl, or sink to remove seeds; use finger to remove any remaining seeds. Cut into a 1/4-inch dice. Add to medium bowl. When water comes to a boil, add corn cobs (if cooking) and boil until just cooked, about three minutes. Remove cobs from pan of boiling water and run under cold water to stop cooking. 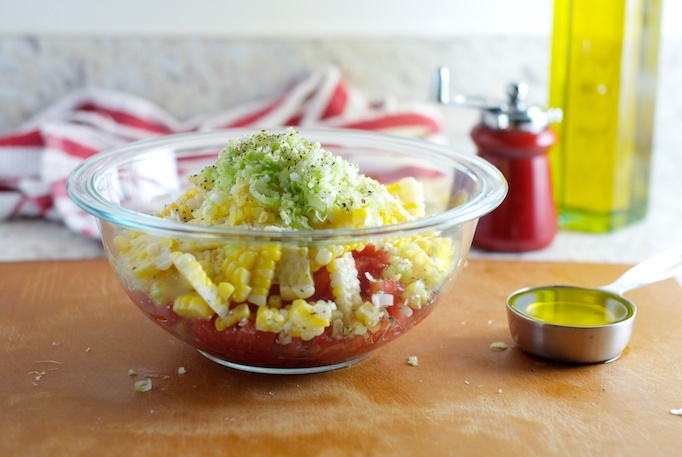 When cool enough to handle, cut corn from cob and place in bowl with tomatoes. Add olive oil, garlic, scallions, salt and pepper to taste. Set aside. Return water to boil and add 1 tablespoon of salt and then pasta. Cook pasta to desired doneness. Drain and return to pot. Add sauce and bacon (if using), and toss to coat pasta. Garnish with remaining scallion. Serve immediately. Dish will not be piping hot, because tomatoes are cold. Yes, still counting. We have some sitting in the garden waiting for a recipe. I made the raw tomato sauce and herbs from the same cook book for a family picnic on Labor Day and it got great reviews. I’m about to make your pesto sauce recipe to use up the huge amounts of basil we have.